Brighten your little one's room with the youthful design in the Riley shag rug. The incredible soft pile is made of 100-percent polyester microfiber over 1-inch thick and hand-tufted with a high and low textured pattern for an added pop of playfulness. 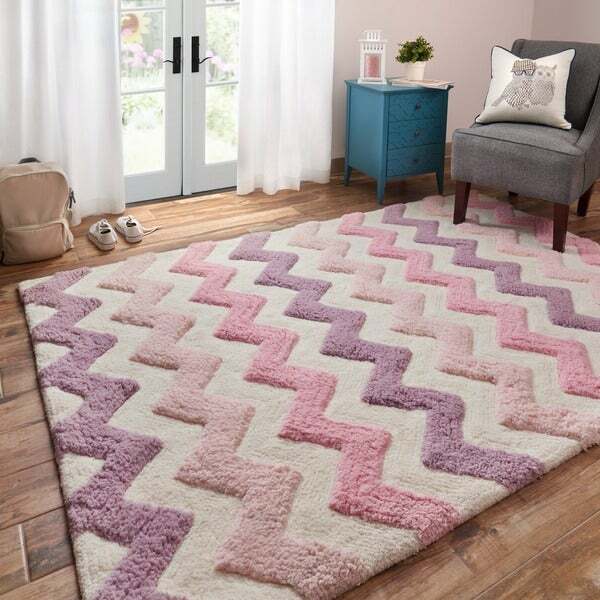 This rug features a chevron pattern. The Riley shag rug was truly designed with kids in mind and is perfect for newborns, kids, and preteens. It also comes in a variety of sizes to fit any bedroom or playroom to make their space special and fun. Update: This rug can NOT be vacuumed... it says it on the label.... a little ridiculous for a rug... it is only cute if u never step on it. The white is pretty white and gets dirty easily. I am changing my original 4 star review to a 2 star because without being able to vacuum or wash, this rug has a very short useful life. Original review: This is a super cute and soft rug that doesn’t shed too much. The only negative is that it gets dirty easy and it is hard to vacuum. I’ve only had it up for 2 weeks and it is already starting to show. However, my daughter is absolutely in love with it and even use it to lay on it and read books in it. My daughter loves this rug - she's 8. It's pink, fluffy and thick....just what we ordered. This rug looks beautiful in the picture but not in person. It came dirty and if you don't own a special vacuum you can't vacuum it. The waves are raised so vacuum can't attach. I was very disappointed. Rug also had a very chemical smell to it. The rug's colors shown are exact. The pink and purple colors are a perfect match for the comforters I had purchased for the girls' bedroom. The rug is very soft and plush! I totally recommend this shag rug! Gets dirty easily and isn't easy to clean. 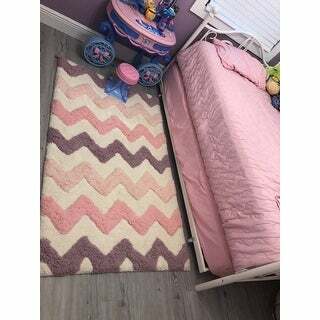 My grandaughter has her room all done in Chevron. This rug fit every color and is the perfect size for her double bed. It is also very soft and found it to be very durable for a preteen. I love how the colored sections of the rug/chevron are raised. High quality piece! The chevron pattern is raised which makes it look cute and upscale. Rug is very soft and thick. But instruction says do not vacuum? Don't know how to keep it clean if I can't vacuum. We purchased this rug for our daughter's nursery. It is incredibly soft and the colors are just beautiful. It made her nursery appear so much brighter. We can't wait to take pictures of her lying on her rug once she's born. We love it! My only complaint is that the rug was delivered a bit dirty along the edges. Better packaging needs to take place. I may have to request a replacement. The softest rug ever!! I love the thickness and it looks beautiful in my daughters room. I would definitely recommend it. It had a lot of loose shags and is just not a good purchase. I really used it 1 month and donated it to a family who had a fire and needed some stuff. This may have been my fault too.. like why get a white rug? My grandaughter wanted this and it was getting dirty in 2 seconds.. This rug is beautiful. So soft and my daughter loves the feel and it makes her room look. Very cute rug, especially for a little girls room. It is super soft and plush. The only downside is that it gets dirty easily and is very hard to clean. Rug is extremely soft and big. The colors are exactly as pictured. I got the gray, black, and white one. I was not disappointed at all! I would most definitely order this again! I LOVED this rug for my daughters room. It fit perfectly and it was nice a fluffy when I got it and the first month or so. Then I have try and vacuum it- not easy! It’s a def workout! And the fluff is getting a bit matted. That’s why I took off the 2 stars- very hard to clean and loss of fluff. Either way my lil girl still loves her rug! Very soft, very cute. Only down fall is a little hard to vacuum. I love this rug in my bathroom. It is the perfect size and so, so soft. Your toes just sink into it!! "Can we wash this rug in the washing machine? We have had it for 1 year and it is really dirty, and the vacuum cleaner doesn't work that well on it. Thank you." I chose this rug after reading the reviews and decided that this would be a great buy for the girls' bedroom. Hopefully the colors and design of the rug will match the comforter sets in the room. When I compared the rug to the comforter from the online picture, the colors looked very similar. I am keeping my fingers crossed that they are a match. I am looking forward to receiving my order! Thank you!